By Gerhard Engel, Generalleutnant a.D. In spite of its local limitation the second battle for Aachen, which ended on 20 October 1944 by the surrender of the last troops occupying the city, had resulted in heavy casualties and great losses of materiel for both sides. Because of the intensity of this battle of attrition and the incomprehensible order which allowed the encirclement of the forces remaining in Aachen, personnel and materiel amounting to that of almost two divisions had been lost. The forces remaining on the general front were greatly exhausted and unfit for defense duty. On the other hand, information from prisoners taken during and after the battle showed that enemy losses of materiel, particularly tanks, and casualties were so great, particularly in the American 1st Infantry Division and the 3d Armored Division, that these could not continue the attack. After 21 October the entire front of the division and that of the right and left adjacent units became almost completely quiet. There were only nervous artillery duels and senseless artillery raids to indicate the front, but no infantry fighting. In spite of many casualties and considerable losses of materiel, the 12. Infanterie-Division (GE) had kept its units intact and maintained their former order of battle. The combat strength of the companies averaged one officer and up to thirty men in the infantry regiments. About 50 percent of the medium guns, especially MG's were lost. The artillery was better off; almost all batteries still had their four guns. Only a few had been reduced to three by air raids or direct hits. The losses of artillery personnel were insignificant. The antitank units were in worse shape. In the antitank battalion one assault gun company returned from the heavy fighting at Schleiden next to the right adjacent unit with only two assault guns fit for use. Almost half of the 75-mm antitank guns had been lost, but the entire materiel and personnel of the antiaircraft company was still available. The engineers had also suffered many losses; the average company combat strength was one officer and forty men. This was particularly unfortunate, for they later had to be employed as infantry units several times. The losses of the fusilier battalion were about the same as those of the infantry regiments. Here too, the combat strength averaged one officer and up to thirty men. The morale of the division and the will to fight were not broken. It knew that it had achieved a great success of defense; it had not been involved in the loss of Aachen. After the arrival of several personnel replacement transfer battalions and the return of convalescent men, the division would again be fit for defense. The hope that the division, which had fought through two weary major battles, would be relieved was soon shattered. On 20 October the LXXXI Army Corps (GE) ordered the division to strengthen and improve its present line as the MLR, and build positions to the rear in accordance with instructions that were to be issued later. The division first ordered all units to form reserves to provide the necessary support for the expected combat. Every battalion was to have at least one company behind the MLR and every company at least one reinforced rifle squad. Larger reserve units were impossible because of the decreased combat strength of the regiments. The painful losses of platoon and squad leaders were to be balanced by courses for proven subordinate leaders, which began immediately in the replacement training battalion situated beyond the Roer river. In addition, reserves were needed for forward artillery observation posts to compensate for the great losses during the second Aachen battle. Near the end of October the division received two personnel replacement transfer battalions, each with a strength of about 500 men. These replacements filled the most critical gaps, bringing the company combat strength to about 60 to 70 men. Fortunately a battalion of about 350 convalescents, old experienced division men, returned in the beginning of November. As fighting men these returnees were three times more valuable than new, untried replacements. Efforts were immediately concentrated on building positions. From the Army Group came detailed orders on the construction of rear positions. From 100 to 200 m behind the MLR for major attacks, a similar B-line way to be built in a line running parallel to the front trench. When the enemy launched a major attack, the units stationed in the MLR would withdraw to the B-line to escape the drum fire and air raids which preceded such an attack. The advantages and disadvantages of the MLR for major attack have been discussed in detail elsewhere. One of the weaknesses of such a line is the fact that only rarely can the start of a major attack be accurately determined in time to permit the troop movements without alerting the enemy. The B-line ran as follows: the road Aldenhoven - Aachen (included) - group of pillboxes at Wambach - Steinbachs-hochwald - Steinfurth - target range in the Eschweiler forest -southern edge of Hastenrath - Scherpenseel - southern edge of Hamich - Hill 265.2. The C-line ran: Vorweiden - Merzbrück - southern edge of Röhe - northern edge of Eschweiler - Aue - Nothberg - Bovensberg Forest - Heistern. The D-line ran: western boundary of Broich - southern edge of Sankt Jöris - northern edge of Röhe - southern edge of Dürwiss - southern edge of Lamersdorf - hills and slope of Lucherberg - northern edge of Echtz. Further constructions for the Roer sector were being built by the Army Group and the Army. Because the division had not yet reached its authorized strength, it could make only limited improvements on the MLR. A construction battalion, which was assigned on 25 October, built the B-line, the division had to postpone the building of the C- and D-line. Part of their construction was taken over by the LXXXI Corps augmented by units of the Todt Organisation and the Army and Luftwaffe. 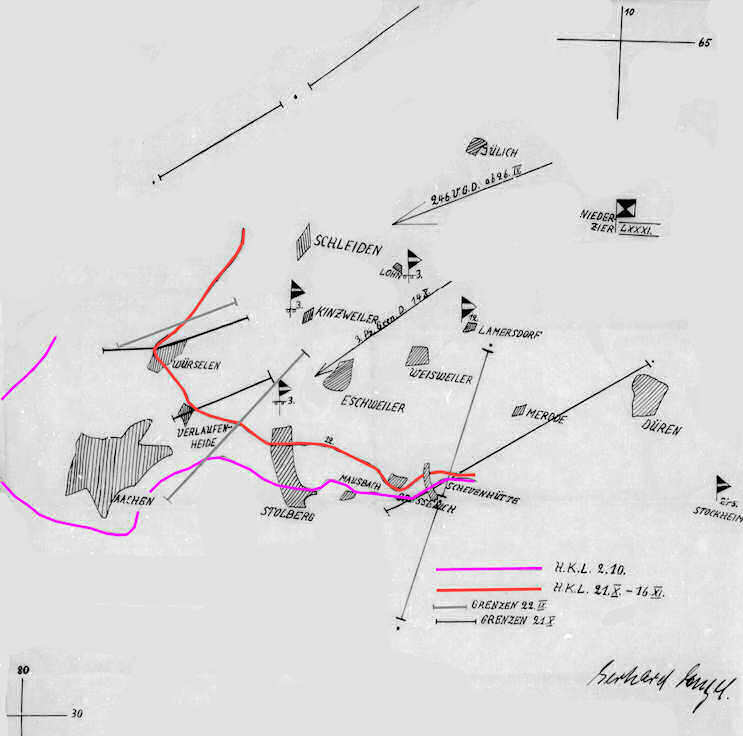 The division engineers were ordered to install wire and mine obstacles in the area before the MLR, a task, which required all engineer units. The removal from the front of the fusilier battalion for employment as reserves placed the remaining three infantry regiments at a disadvantage. The battalion was ordered to build the B-line, beginning at the most vulnerable spots, which included the area of a previous enemy penetration north of Eilendorf (near Verlautenheide), the combat area in the center of Stolberg and the hills near Gressenich. The division knew that quiet on the front was temporary, that the major attacks by the Americans could be expected after they had reorganized and moved up reinforcements. The major strategic objective of the enemy had to be the Rhine. To reach this point, the road Aachen - Jülich, the area near Eschweiler and the hills of Langerwehe would be important first targets in the area of the division, for these points lay in the path the lowlands and the area on both sides of the Roer river. Only from the hills of Langerwehe and the area near Eschweiler could the enemy gain the necessary observation points for an attack between Jülich and Düren. For the defense of its area in the next battle, the division was favorably situated in the MLR; this was especially true of the observation posts for artillery and medium guns, and the antitank defense. The lines of defense behind the MLR were less favored by the terrain. Therefore, all efforts had to be concentrated on improving the MLR before the attack, for in the early fighting this line would have to bo held at all cost and any section that was lost would have to be retaken. During the first part of November the enemy was strikingly quiet. Apparently the Americans had issued strict orders on the camouflage and concealment of their forces. It was particularly surprising that the enemy carried out no ground reconnaissance to find out our intentions or get information about our strength. Not until the 13 to 15 November, three days before the attack, did thrusts of several combat patrols indicate any enemy activity. These patrols, which were all repulsed, proved valuable clues to the probable main points of the American attack. It was surmised that these points would be in the right sector of the division; at Duffenter, in the center at Werth and in the left sector at Gressenich. From prisoners it was learned that the enemy was attempting to locate the main German outposts and capture prisoners to learn whether the 12. Infanterie-Division (GE) was still in the sector. Our reconnaissance patrols ascertained from prisoners that the enemy had shifted forces. The American 9th Infantry Division, which had been in the Schevenhütte area on the left sector of the division, had been out. The division supposed that the entire sector of the 9th Infantry Division (U.S.) had been shifted further to the south; but there was also the possibility that it was being reorganized as a result of heavy losses in the previous battles. During the first half of November, as soon as weather increased steadily. Fighter bombers maintained almost continuous control of roads in the forward combat zone. After 10 November the appearance of numerous American artillery observation planes was particularly foreboding; here was the best clue that major combat action could be expected soon. These planes, the so-called "Oysters", which were closely coordinated with their batteries, systematically helped the American artillery register on certain observation posts, road forks, crossroads and edges of villages and towns. For hours they circled near the MLR, constantly alarming our troops. They became more cautious after the night of 10 November when the division's anti-aircraft company, which had begun to be moved up to the MLR, opened fire. Two planes were downed the following day and the "Oysters" began to fly at greater altitudes and keep a greater distance from the MLR. After 13 November smoke shells were systematically fired against our observation posts and other points in the terrain that offered especially good targets. A few of our firing positions, which had been recognized were also bombarded systematically. The noise of tanks moving in the central sector behind the slopes of Diepenlinchen indicated that the enemy was assembling for an attack. Meanwhile enemy air activity had become so lively that shifts, troop movements and the transportation of supplies and ammunition was no longer possible during the day. radio messages had frequently been transmitted clearly and carelessly. The division had also made good use of the time preceding the battle. The mining of the terrain, particularly spots vulnerable to tanks assaults, was completed, practically with no gaps. With little disturbance by the enemy, about 10,000 mines were laid in the major defense points by the engineer companies each distributed to a regiment. Before the MLR there was an uninterrupted, though thin, wire obstacle. As much as possible, the division completed the preparations ordered by its superior headquarters. The division morale had not been affected by the two preceding major defense battles; rather it had become a western front division tested in hard battle and accustomed to the American methods of fighting. Hill 259.2 - Hill 235 - eastern edge of Albertshof - Am Obersten Busch (south of Werth) - Hill 219. The line of combat outposts and strong points was the farm of Schwarzenbruch - Schneidmühle - northern point of Grosse Halde (occupied only at night) - Steffenhäuschen - Hochweger farm - Hill 283.3 - northern edge of Buschhausen -Schevenhütte North. The enemy had the 104th Infantry Division (U.S.) opposite the right wing of the division and the 3rd Armored Division (U.S.) and 1st Infantry Division (U.S.) opposite the central and left sector. A Luftwaffe reconnaissance flight revealed that the enemy artillery had recently been reinforced considerably. The main points of concentration of the enemy artillery were observed in the Kornelimünster and Brand area. Other urgently needed data about the enemy could not be obtained by the Luftwaffe.